2 batteries in parallel the voltage stays the same and the capacity doubles. So 2 12v 100AH batteries electrically become a 12v 200AH battery. Parallel is + to + and - to -. 2 batteries in series the voltage doubles and the AH stays the same. So 2 6v 200AH batteries electrically become a 12v 200AH battery. Series is + to - and the load is connected to the - of one battery and to the + of the other. The standard 6v battery is a CG-2 or a T-105 they a 200AH capacity. There is no standard 12v battery, depending on the RV you may have a GP 22=55AH, a GP 24=80AH, a GP 27=90AH, a GP30=110AH or a GP 31=125AH. It all depends on space and the P/O's budget. You would not normally use 2 12v batteries in series. That would be a 24v system. 200w of solar is a goodly amount for an RV, so if they do work you're golden. Most solar controllers have a 10 or 15 amp load limit through the controller. IF your total 12v load is below this limit then you can make use of the LVCO. If your total load is more than this you have to connect the load to the battery and just leave the load terminals on the controller empty. If you have an original 1980 converter they are a very poor design. It may say 35 amp converter but that's the 12v load power. The battery charger is usually only 1-2 amps. A modern 35 amp controller can charge the battery at a full 35 amps. If your running 12v power (lights, TV, fan) then the battery charge rate is 35 amps - the load. So a 10 amp load means that you have 25 amps to the battery. A battery will only take the charge level it needs. So if it almost charged and even if you have it hooked up to a modern 35 amp converter the battery may only take 2-4 amps. The same thing applies to your shore power system. If you have a 15 amp plug and use an adapter to plug into a 30 receptacle its not going to force 30amps into your RV. 1984 Sunrader 18' - a good idea to purchase? What is your general location? There a bunch of web watchers here that are always looking for Toy MH's that need a new home. In the search for Toys, a 200mi+ drive is not unusual. in Engines - Transmissions - Drive Train - Suspension - Chassis - Steering - Exhaust - Tires - Etc. Well for starters it's an inline 6. There are some conversions using the MBZ 5 cylinder. But a 6 may be just too long. The 5 bolt spare tire chain holder needs to be modified for the 6 bolt rims. Make sure yours is correct. Well the good news is that someone has upgraded the rear axle to a true 1 ton. The bad news is your shocks need to be replaced. You have mismatched shocks. The problem I see is I don't know is if you need 1982 shock set or a set of front 1982 shocks and 1988 set for the rear. Air shocks are not a good idea, because all stress is placed on the shock mounts. Airbags are much better because they place the stress on the leaf springs and the frame rails. Just CALL the folks selling the spring paks and ask about 75-83. Save a bunch of bandwidth. Which Toy would you buy? You have to inspect in person. Make sure everything works. Have them plug the RV into 115v ( household current) and start the refer. Check the water pump and lights plugged in AND unplugged. Don't forget the previous moisture checks too. In order of replacement $$$ Refer $800, water heater $500, Power Converter $175, water pump $80. Then there are tires, brakes, shocks, airbags, rear springs. If you don't have skills most RV shops charge $60-100 an HOUR. So buy the best one you can afford, its cheaper in the long run. 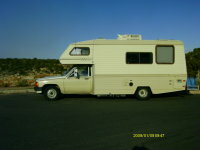 If you don't trust yourself to evaluate one then look in Craigs List for a mobile RV mechanic. While they seem cute they are still a fully functional RV with all the stuff as a 40 ft one. The Dolphin is bigger inside. The Dolphin has a reputation of poor quality build, a tendency to leak and have rotten wood. Being parked outside make this more probable. This really depends on the maintenance of the P/Os. The Escaper should have an aluminum frame, while it may leak it won't rot. Make sure about the 1-ton rear axle. Post pictures of the rear wheels and we will let you know what is what. ?Source for Toyota leaf spring bushings? Transmission cooling fan with thermostat - where to mount? If you're going to be using a temp sensor controlled fan for your trannie cooler, you can mount it horizontally. Your sway bar mounts are some of the worst I've seen. 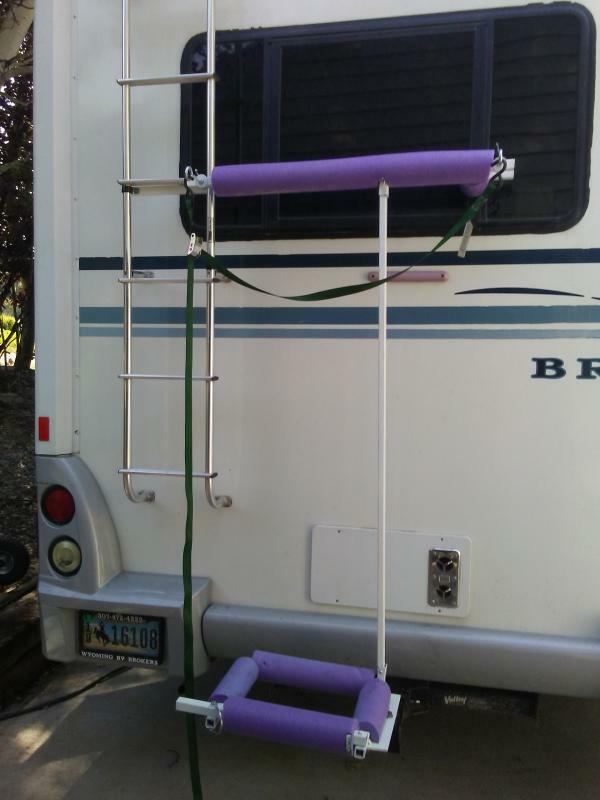 Here are what you need for a simple mount setup, its flexible enough to mount the bar on top the axle, behind the axle or under the axle. Important measurements are axle tube dia. and the sway bar dia and the width of the u-bolt. 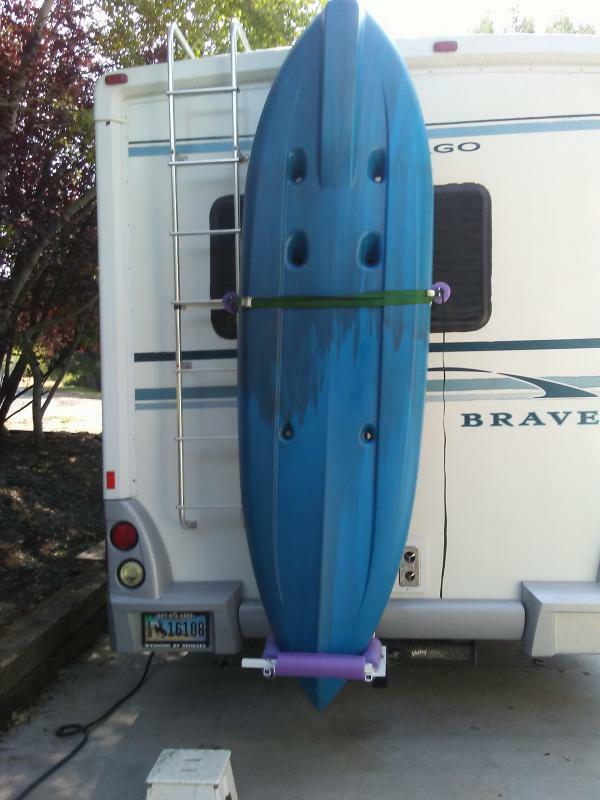 You may have enough stuff with your old brackets to just need the muffler clamp saddle. Some have used a carpet kit for the extended cabs, its too long but it's easy to cut to an exact fit. Again "some" have reported the standard cab kit is to short to properly fit the cab/house interface. considering buying a 1992 Hiace camper - is it worth $20K? The living space is way smaller than a 18 ft. Its going to feel real small after a weekend. There is a drain valve and a pressure relief valve on the water heater, turn the pump on and after it stops open one and see if water comes out of the tank. The pump should kick on after a few seconds. If you don't know about the amount of water in the tank, shut the pump off and open both drain valves when it's empty, start over. It takes 20-30 min to heat a full tank of cold water, so give your WH a chance. You should hear the jet engine sound for the entire time. When the heater stops then turn on the closest hot water faucet, let it run for a while. If the tank doesn't have water, the heater shuts off after a minute or so then you have lots of problems and need the manual. An operating WH sounds like a jet engine when it's running. You should have a DSI WH (direct spark ignition) when you turn the switch you should hear it spark several times then the burner will start. Failure points. There is an overtemp safety thermistor that fails , spider webs in the burner, dirty spark points and the thermocouple/flame detector. If you don't have a factory manual you can download one from the internet. interesting. if i pick those ones up ill report back. Im always a little apprehensive about items like that on ebay with no brand or additional information. But i still would like to know if anyone has a method for removing the bushings. Easy peasy, a 20-ton hydraulic press, and various sized drivers /pipes. Pick and Pull places are being really thin on old trucks. Your model was built from 1972-1978, good luck. While the truck's axle may be less abused, but it would have a zillion miles on it. On my homemade plan C, I bought a bunch of swimming pool noodles at season close out. I'll use them eventually somewhere. The hitch mount carrier looks like the 2x2 vertical is bolted in. Just get a longer 2x2 drill it, paint it and bolt it in. You should take a close look at the frame of your old truck and the floor of the shell. On many of the Toys, the floor height is determined by the kick up on the frame for the rear axle. If you haven't checked out this thread you should look at the frame carefully. Here is my plan C.